Few times in our lives can passions be lived to the fullest measure - for some, maybe never. I was one of the blessed, and lucky few who savored, lived, and loved my dreams of horses, now - for over 40 years. I struck leather for the first time knowledgeably, around age ten under the hard scrutiny of my Grandfather’s knowing eye. He was one of the last real cowboys of the open range ( Late 1800's era ), and a trainer who loved the outlaw, reject, or severely injured horse. Through his endeavors and trials with them, I gleaned invaluable experience - and from his genes came the unquenchable passion for the love of horses from birth. As Lead Cowboy for almost seven years, I sat atop some of the finest bred American Quarter Horses that ever breathed air, and interpreted the history of Texas, and the George Ranch to thousands every year. As the crowds looked on, we also demonstrated life as the cowboy does it - in full partnership with his horses. They began to realize the prize that the combination of a great cowboy with a great cowhorse made for the rancher, and how much work could get done in a day’s time with such. 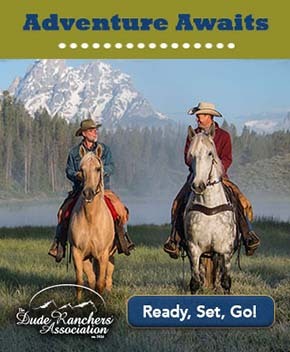 The equation still stands : Cowboy = Ranch hand and Cowhorse. Every day on the George Ranch started in the quiet of the early morn. Across the carpet of Saint Augustine Grass came the clomp of boots and spurs, which were muffled by the hundred year Oaks that draped wide over the brims of the passing Stetsons below. Cowboys congregating in silence, other than the quick utterace of, " Mornin’ ". As in the old days cowboys all met at the big horse barns, and brought in the daily work horses. As the chorus of chomping oats began during feeding, the cowboys’ harmony of tossing hay, cleaning stalls, and watering down, filled the barns. Being the Lead Cowboy, I had to teach the new hands how to instinctively inspect their horses through the morning ritual. It is the basics that forge a good cowboy, but the list is long, and the time invested in learning this life is never - ending. Cowhorses are high performance working hands - not just riding horses, and there’s a monumental difference. The slightest ignorance of lameness by the cowboy, and his partner may not work again. Some cowhorses are high strung, or anxious, and a good cowboy has to surgically cipher the difference between a behavior ( Training ) problem, and pain response. Feeding done, the cowhorses are lead to the long hallway in Barn #1. Here the finishing grooming is performed, and saddling takes place. Under my direction, the horses are ground tied, and never tethered to anything. I give a horse free will to run away. They stay because they want to - rather it’s an understanding of duty - or, maybe they just like being around you. They stand in their spot as statues amid the busy freeway hustle of cowboys ducking in and out, saddles and tack passing to and fro, hoof picks picking, and manes and tails pulled and brushed. The saddles are custom fit, and hand made for each horse, so that their backs are not damaged. There is no cross - saddling. The blanketing, and placement of the saddle is applied exactly, each and every time. Keen cowboy eyes inspect each piece of equipment as it is installed. Proper fit, clean equipment in good repair. Horses dressed - so follow the cowboys from head to toe. 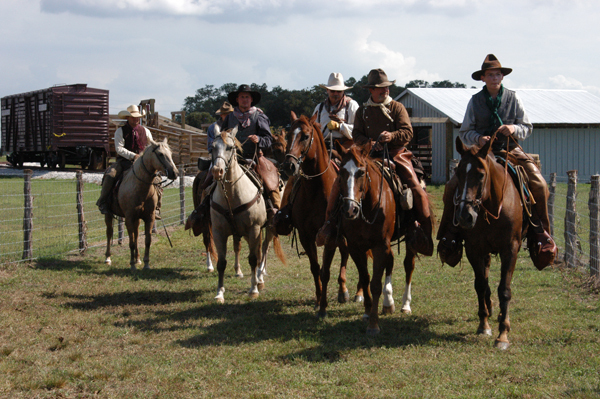 Hats, chaps, boots and spurs adjusted properly, and we’re ready to ride the wide plains of Texas! Assignments for the day spelled out, the horses are lead out of the barn and mounted for warm up in the pens. During this tuning period the horses circle in a walk, trot, lope, and periodically are asked for that beautiful cowhorse stop - turn around - flexion and " Leg ". A cowhorse must be an athlete first, and requires meticulous conditioning physically, as well as mentally. I group the cowboys, and out we ride to pick up the cattle for the day’s work. Each day is different from the next, especially on the George Ranch. Each day on this 23.000 acre sprawl might bring Emeril to the ranch to film a show segment, or Tony Perkins and Good Morning America, The History Channel, photographers from around the globe, or a visit from the Queen of Thailand. We also entertained, and educated approximately 20,000 school children about Texas, horses, cattle, cowboys and ranching history, every year. Visitors are allowed to enter the historical park at the ranch, which is a 500 acre living history park. Arriving at the 1930's working part of the ranch we deliver programs to them in relation to cowboy and ranching history. The horses are the highlight of everyone’s experience no matter how old or experienced - or from what country they may hail. They are shown the basics of roping, cutting, and sorting techniques, and why we do it. I remain remarked at the deep interest the visitors showed, as most of them had never seen a horse up close, or will ever ride one. They wowed as my mare, Rio would cut a cow - but they lost their breath when I took off her headstall and reins, and she committed the same job, without a miss. During the roping, a long yearling would be headed and healed, which some had seen in rodeos. But they went silent as our cowboys left the saddle, and doctored the cow with the cowhorse holding the rope, and maneuvering all by himself to aid the cowboy. They were further remarked that the cowhorse stayed in the exact position left, until the cowboy recovered his rope, and climbed back in the saddle. One of the favorite attractions was my little cutting horse, Buck The Wonder Horse. I saved this horse from slaughter, and turned him into a superior cutting horse at the ranch. Buck was long on personality, and had superior intelligence, and an uncanny charisma with old and young alike. I taught Buck how to move his mouth like Mr Ed of T.V. fame, and I did his voice. He wore my cowboy hat, and a bandana on his nose shaking his head , " Yes" when asked if he wanted to go rob the train. I saw the laughter in those ploys, but I also was blessed to witness the hurt, sick, disfigured, autistic, and simple - gleam - even if briefly, as Buck laid his head on them. His uncanny compassion to the afflicted remains a mystery to me to this day. Some of the horses we brought to the ranch, came from the Texas Department Of Criminal Justice, namely the Texas prison system. I enlisted the help of a good friend, Doug Cadenhead, to supply our cowboys with horses bred well, that we could train into cowhorses. Texas prisons are unique, in that they still use close to 2,000 horses state wide. Some horses are bred there, some bought from the ," Freeworld", but all, trained there for different jobs. The Quarter Horse - Percheron cross is used for some of the field bosses to ride to monitor inmates working in the field. Straight working cowhorse bloodlines are used for the state cowboys, others are used for searches, and missing persons. These horses all wear one of the most prestigious brand in the world on their left shoulder - the Lone Star Brand, that shows they belong to the State Of Texas. These horses were all born to work cattle, but once they heard the cheers from the visitors, they began to love to be show horses, and they really were beautiful. Rio, Horse # 1-R10, appeared in the American Quarter Horse Journal for her role with Tony Perkins on Good Morning America. He gave the national weather from her back, and afterward my phone rang off the wall, and visitors came from all over the country just to have a photo made with her, and meet her. Rio was a beautiful bay mare, who looked really feminine in the face, but was really muscled in the body. I once had a German man say that he wished he could find a woman like that ! She was also a big mare, at 15.3 hands, and @ 1300 lbs. I loved working with her because she was so fast, and could cut a cow like a little horse - but, she was stout enough to rope and pull a grown bull. She was one of the most gentle horses with people I ever recall, but she was a hard -core working girl, and did not like to be babied, or cooed at. Diablo, Horse # 3-57, and Big Brown, Horse # 4-8, were like bookends in the cattle operations. Both stood over 16 hands, and weighed in @ 1400 lbs. These big boys could really rope and drag anything, and at 21 and 22 years old respectively, they could out work just about any young horse on the place. They were as the other horses, created with a gentle disposition, but launched with explosive speed and intelligence when called to work cattle. They were great showmen, and Diablo would get so excited when he heard people applaud him, he would salivate to the point that he had to keep his tongue licking his lips. We looked at these guys as our front line. They were hard muscled, young spirited, and tough as they come. The end of each day saw happy visitors headed home, loading their children carefully in their cars, or hundreds of school children mounting their buses. As we turned the cattle out for the day, visitors would wave vigorously at us with huge smiles. They would call either our names, or the horse’s name out loud, and yell beautiful ending comments to a great day in the saddle. 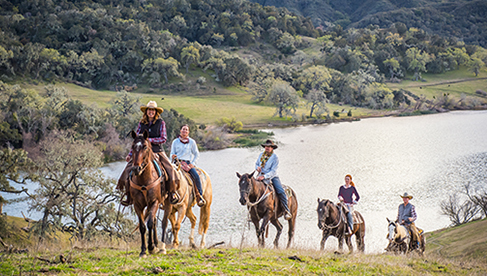 As they departed from us into the regular world again, they talked, laughed, and shared their experiences of wonder that the day on the ranch had given them. We drove the cattle home to feed on lush green grass, drink cool water, and repose across the warm Texas plain. We all drifted back through the day in our memories, as we reckoned our way back to the big barns. The sun always set hugely across the curve of the Earth in the West pasture, with each day’s end a post card snapped in our mind. Mother Nature’s elements all show off here, as the sunset’s parade marches to the dark, star studded, big sky nights of South Texas’ open range. In quiet reflection, we are returned to the big barns by our horses. As in the morning ritual, the horses take their pose in Barn # 1 for unsaddling, grooming their backs, and a nice bath with soap and water. Once finished and water bladed away, they are lead to Barn # 2 for feeding. Some will be loaded in the trailer for delivery to one of the big pastures for a short vacation away from the hustle of work. With the horses bedded for the night, cowboys did what they have always done - engage in heavy story telling, and savor food, and drink. Once tired sore muscles were laid out for sleep - the dreams of the cowboys’ world dance to life : Dashing across the widest grassy plain after the cow that could never be roped, fanning the bronc that could never be rode, courting the lady that all had their eye for - legending yourself to the ranks of Pecos Bill. Next morn brought the blessing of another fantasy day - so out of step with the rest of the busy world - and so honestly appreciated. So my life on the George Ranch went for almost seven years. There are so many stories I would like to share, however this should give you a peek at the experience, and the passion of one day. I thank God that the dust will never settle in the dreams of those who cherish the way of the West. Horse and Man fused together in memoriam, and so well known to the whole world as the Great American Cowboy. Until we meet again . . . .
I’m Still Ridin’ The Wide Plains Of Texas !! Jim Hodges was lead cowboy at George Ranch in Texas for many years and is a true American Cowboy himself. 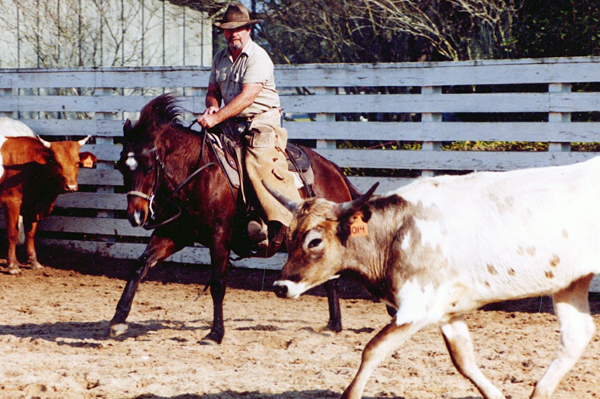 His passion from birth played out as a cowboy and horse trainer for over 40 years. 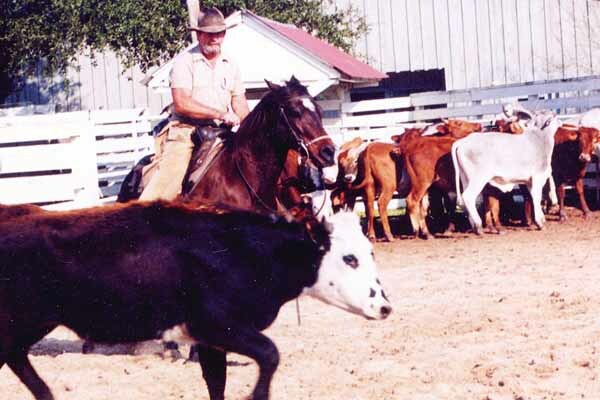 He specialized in training problem horses, and cowhorses, mainly in the Quarter Horse breed, however Jim has ridden in almost all disciplines on various breeds. Parallel to that Jim has been and continues to be an inventor, entrepreneur, consultant, public speaker, as well as a 20 year veteran police officer. He is also a combat veteran of the Vietnam War. 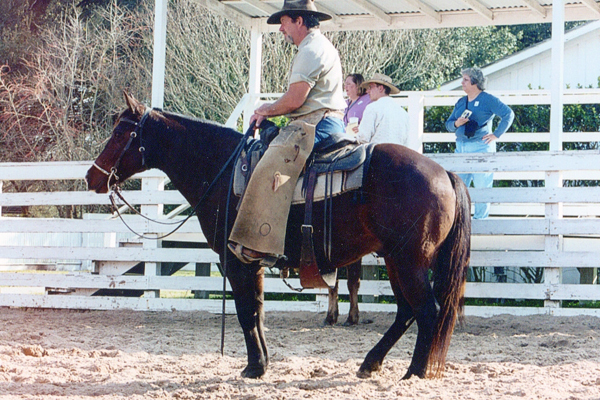 Jim is a member of the National Cutting Horse Association, and the American Quarter Horse Association. As Jim states, he has one philosophy : Learn from the BEST what they will share - learn from the worst that you don't become them. Learn more about Jim Hodges.